After a run of disappointing results I was hopeful that I could salvage some champion league points at How End with the MFS lads. I've had quite a good run at How End and was pleased to be fishing Yasi's a lake I've had most time on. 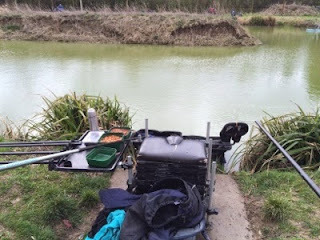 The fishery was really busy with a How End Team Winter league decider being fished, so it was great to see some of the other lads, luckily there was one space left in the car park for me. Baz ran over the net rules only to be corrected by Pebs... how many times have you fished here Baz? My lot for the day would be peg 12. Another adventure to deepest darkest Essex on one of George's matches. It would be an early start for me and I woke up before the alarm went off. Switching the alarm off and putting my head back on the pillow was a fatal mistake... I re-awoke at 7:55am, the drive was an hour and the draw was at 9am and I hadn't even loaded the car! Luckily traffic was light and I just made the draw, much to the amusement of everyone who was waiting for me. Thanks lads. Only just making the 9am draw, there were two bingo balls left in the bag, I ended up with Peg 12. The lads thought I wasn't going to make it, neither did I, especially with all those horrid speed camera's on the M25! Based on my previous experience here back in December, my match plan was pole going to be a pole only attack. Given the prolific sport at the fishery and reports of the previous days match being won with 220lb of fish I was ready for a great day. A very heavy night in the Lodge. The tequila came out and it proved my undoing. To say I was a bit rough was an understatement! The Draw Open draw today, I took out peg 14 on Pines, aka the Fridge as no sun hits the bank and it’s pretty cold all day long. The Set-up Speaking to Andy G who fished the peg yesterday he told me to fish 14 metres on the right in the white water, so I set up two rigs that let me fish 14 and up to 16 metres on that line. Red maggots, worms, casters and groundbait was my bait for the day. The All-In I cupped in some wetted groundbait together with chopped worm and caster and went straight over the line with a single red maggot. Bites were instant! A small roach straight in the net. This form continued for an an hour which while welcome is tough work when shipping 14 metres for a very small fish. The Draw Herbie had seeded all the anglers today. One of the seeded anglers would pick where we would be fishing today. Woodpeckers low numbers was my lot for the day, out came peg 10, aka the “swivel” peg. I’ve fished before a few years ago so I felt confident. 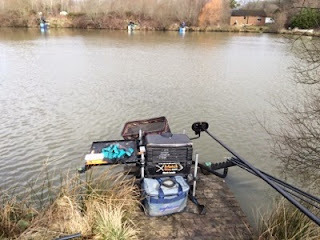 The Set-up Three pole lines today: 14.5 metres to the left of the peg14.5 metres straight out from the pegWorm line at 4 metres for the perch or tench Two rigs served the 14.5 metre lines, a “99” double bulk rig and a red depth rig. The All-In Chris Martin had fished this peg the previous day and had killed his peg by putting in too much bait, so it was another negative approach today. A night of darts against the cockneys and beers at another lodge for a change… Chris Martin did a disappearing act half way through the night, next thing we can all hear him snoring away. Andy G kept us entertained as per usual. I left around midnight and the rest of the lads came back to the lodge and had a bit of a late night, about 3am. I never heard a thing as I was fast asleep. The Draw Another organised draw by Herbie, calling the groups in to draw and kicking the rest out of the tackle shop. It worked well! The Set-up The wind was blowing across the peg which made it difficult plumbing up the 13 metre line straight ahead of me. I decided on some back up plans, a waggler and feeder rod. After another surprisingly quiet night it was up early ready for a day on Tanners. All of the Lodge of Plenty where hoping for a draw right outside Hollywood Lodge both in case the weather turned bad and also for the short walk to the peg. The Draw A very organised draw by Herbie, my spot for the day would be peg 35 on tanners, one off the flyer, but I was confident when arriving at the peg. The Set-up With the weather forecasting wind, I had plenty of open water in front of me so I broke out the rods, a feeder and waggler rod where the weapons of choice. I also setup two 13 metre pole lines in case the weather was kind. Bait again was dead reds, pellets and groundbait. The All-In My match plan was to feed both 13 metre poles lines negatively, one with micro pellets, the other with a ball of groundbait with no loose offers. A very quiet night in the Lodge of Plenty including a dip in the hot tub so we were all bright eyed ready for our breakfast as cooked by our residence personal chef Colin. The Draw 8:30am draw and as usual Redarmy manages to push to the front of the queue. My home for the day would be Emily’s peg 7. Emily’s is behind the tackle lodge and as yesterday it’s a lake we’d not fished before on the Silvers festival. 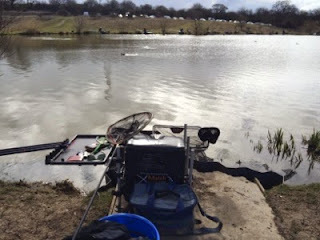 The Set-up I spoke to Jamie (one of the ASBO twins and my team captain for the week), who said, pellet at 7 metres. So I set up a couple of pole lines to fish 7 metres at the usual 10 o’clock and 2 o’clock. Two rigs to cover both swims, one at dead depth and the other being the ’99’ lift bite rig, where two number 9’s are placed about 1 inch from the hook and the float is dotted down. Dead reds, pellets and groundbait was bait for the day. My 5th year at Stafford Moor with the Match Fishing Scene crew. This is a must not miss festival. We all arrived on the Saturday afternoon, I’d convoyed down with Shedders and his “enterprise” white van. Other people weren’t so fortunate. Colin (Billy No Fish) had called while driving down complaining he had a warning light appear on his dashboard indicating the alternator wasn’t working. “Loose wire my RAC man told me, keep driving and then call the RAC”, Colin said. The call of nature caught him short though. So a quick call to Paul (Animal), they met at a service station near Taunton so that Animal could watch Colin’s car, so saving him turning it off and continuing his journey to Stafford Moor. The call came to Shedders first telling us that Colin had now broken down… the bait an food, he was carrying all the bait and food for the week, hopefully Animal had picked it up.